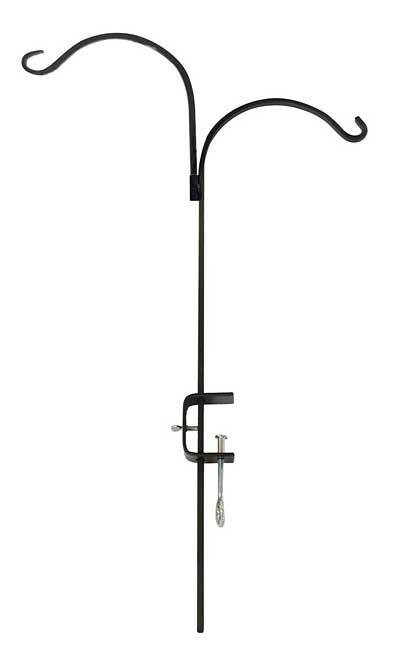 Perfectly hang a flower basket and wind spinner from your deck with The Hookery Adjustable Double Deck Hook with Clamp. Adding this versatile hook to your deck allows you to display your favorite hanging adornment at a custom height, for a personalized look. The straight, central shaft on this unit extends 33" upward, and then forms a 10.25" long hook. This permanently attached, lower hook easily accommodates hanging items up to 20" in diameter, and a square bracket holds the secondary, taller hook for another display. Place the main shaft into the predrilled holes on the included clamp, and use its thumbscrew to lock the unit in place. This innovation ensures a customizable pole, allowing you to raise or lower your items to just the right height. The hefty, metal clamp attaches to wooden deck rails from 0.75" to 3.25" thick, and its large eye hook keeps it securely in place. The black, powder coated finish offsets your hanging adornments, and the steel body will withstand use outdoors for many seasons. Add fantastic hanging area to your deck with this Adjustable Double Deck Hook with Clamp.